The platform is device-agnostic, allowing you to build an application for the iPhone, Android, and BlackBerry devices simultaneously. Developing applications using the PhoneGap framework is a reasonable alternative to building all-native applications in Objective-C. 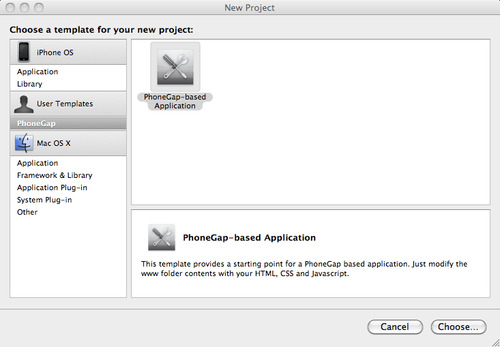 In the past, submitting to the App Store applications built around the PhoneGap platform was problematic. However, since the 0.8.0 release, this has been resolved and Apple has approved PhoneGap for building applications intended for the store. Since the 0.8.0 release, the PhoneGap platform has embedded a version tag into the compiled iPhone application bundle to allow Apple to identify the version used in your application build during the application review process. The easiest way to make use of the PhoneGap platform on the iPhone is to build the PhoneGapLib static library for iPhone. 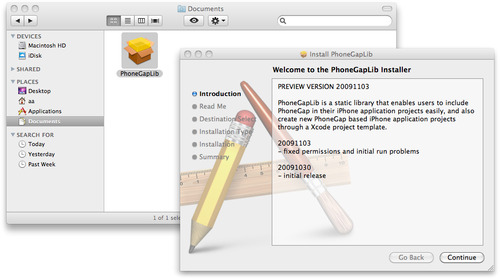 This will allow you to create PhoneGap-based iPhone application projects directly using an Xcode project template file. You can download the latest version of the PhoneGap code, which includes PhoneGapLib, either from the project’s Git repository or from the main PhoneGap website. If you’re downloading the code from the project website, you should download version 0.8.2 or later, as earlier versions do not include the PhoneGapLib library. The PhoneGap platform, and especially the PhoneGapLib library, is under active development and installation instructions are therefore subject to change. If everything looks OK at this point, you can close the terminal window. Now open the Finder and navigate to the iphone/ directory inside your PhoneGap source code folder. Inside the folder you should see a PhoneGapLibInstaller.pkg file. If you don’t see the PhoneGapLibInstaller.pkg file, you can create it manually. In the Finder, open the iphone/PhoneGapLibInstaller directory under the PhoneGap source directory. Look for the PhoneGapLibInstaller.pmdoc PackageMaker document. Double-click on this file to open it inside the package maker and click the Build and Run button in the PackageMaker toolbar. Doing this will build the PhoneGapLib installer bundle, and save it (at least by default) in your Documents folder. If you return to your Finder window and navigate to your Documents folder, you should see a PhoneGapLib installer package file. If you double-click on the PhoneGapLibInstaller.pkg file, you’ll start the installer application, as shown in Figure 1. Accept all of the defaults. 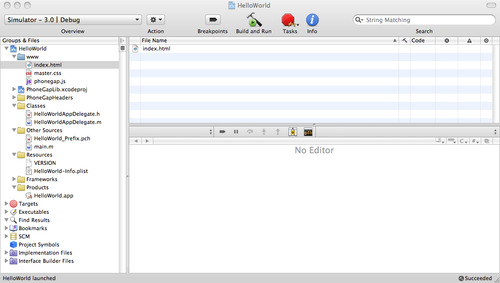 Start Xcode and create a new project. If PhoneGap has been successfully installed, you should now see a PhoneGap project template entry under the User Templates header, as shown in Figure 2. Start a new PhoneGap project, and you’ll see something much like Figure 3. If you click the Build and Run button on the Xcode toolbar, the sample PhoneGap application will build and deploy into iPhone Simulator.